When I was a kid, I used to love to be scared. I don’t mean actually being threatened or truly fearful or anything like that—I mean just the wholesome sort of scariness that peaks during Halloween. Boo! As I’ve grown older, I like to be the one doing the scaring (“I am the one who knocks”). And on Halloween, that can actually be accomplished in the kitchen. True, there are plenty of cooks who are pretty scary in the kitchen, but that’s not what I’m getting at. I’m talking about Halloween-themed food and drink that can, at least, look pretty scary, while tasting pretty great. Of course, you could just serve up some truly frightening food, for reals: stuff like the a-ping, a black tarantula that is considered to be a gourmet treat in a place called Skuon, in Cambodia. They’re fried with garlic and spices. It’s an acquired taste, I hear. And while I have munched on chile-spiced grasshoppers in Mexico, I draw the line at escamoles, which are black ant eggs, sometimes called insect caviar. Ditto my distaste for hachinoko, which are maggot-looking wasp larvae served in Northern Japan with sweet teriyaki sauce. Blech. I’ll also pass on Japan’s malodorous kusaya, also called stinkfish; the fragrance of rotting fish just isn’t my thing. So, for Halloween, how about cooking up some ghoulish goodies that might look scary, but taste anything but? Here’s a roundup of a few of my favorite examples of easy-to-execute Halloween cuisine—scary-looking stuff that both kids and kids-at-heart can savor. And, best of all, you can get the youngsters involved in the making of these foods and drinks. Frightening fingers make for a tasty, terrifying snack, and they’re super simple to make. Grab a handful of pretzel sticks— not the traditional twisty knotted-ropes—or breadsticks about the length of a human finger. Melt some white chocolate on the stovetop or in a microwave. Dip all but about an inch of the pretzel or breadstick into the melted chocolate and garnish the end of each with a single pumpkin seed (pepita), which looks like a fingernail. Refrigerate the fingers for 15 to 20 minutes until the chocolate sets. After that, they can be kept in a container at room temperature. I wouldn’t normally turn to Martha Stewart for creepy culinary tips, but here’s an easy recipe for her scary spiders. Prepare your favorite batter for chocolate cupcakes and pour the batter into mini-muffin tins with paper liners. Bake the mini-cupcakes and allow them to cool. 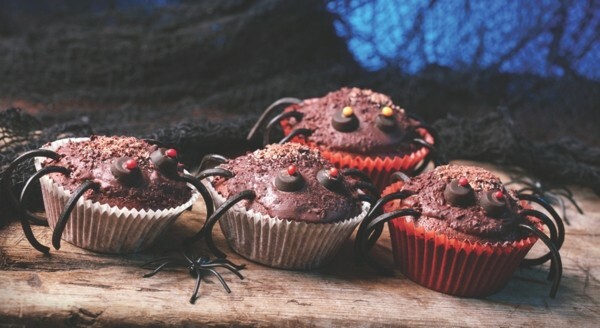 Martha says to then “ice mini cupcakes with vanilla buttercream and coat the icing with black sanding sugar.” Then, use cinnamon candy for the spiders’ eyes and pieces of black licorice (8 per cupcake, of course) for the legs. Cut tiny cones from marshmallows for the fangs. Here is a colorful recipe for Dragon’s Blood Punch, courtesy of Food Network’s Sandra Lee: In a large punch bowl or pot, combine 1 46-ounce can/bottle of red punch (such as Hawaiian Punch), 1 46-ounce can/bottle apple juice, 1 48-ounce can/bottle cranberry juice and 1 2-liter bottle ginger ale and ice cubes. Stir well and serve in clear goblets, if possible. For a grown-up version of Dragon’s Blood Punch—one with alcohol—add 4 cups of berry-flavored vodka and 1/2 cup of orange liqueur. Another simple Halloween libation that kids love is Harry Potter’s Dragon Snot: Place a scoop of lime sherbet in a glass and top with 8 ounces of Sprite or 7 Up. You’ll soon see why it’s called snot. Hey, did you know that Halloween cuisine and trick or treating actually has a rich historical tradition? It dates back as far as All Hallows Eve, the day preceding All Saints Day, which was decreed to be Nov. 1 by Pope Gregory IV in 835. “Halloween” is, in fact, a shortening of All Hallows Eve, duh. In Spain and Mexico, bread called “bread of the dead” (pan de muerto) is shaped to look like skulls, while in England, the poor used to travel from house to house on Halloween singing for a bread & raisins concoction called soul cakes. Here in the United States, the Puritans weren’t too keen on Halloween, and it wasn’t until the 19th century’s mass Scottish and Irish immigration that the haunting holiday really began to take hold. Meanwhile, back in the kitchen, let’s whip up some wriggly worms. This is truly the simplest, kid-friendliest Halloween recipe you’ll ever encounter. Cut some store-bought hot dogs into thin slices, lengthwise—you know, about worm-width. Then, score the edges slightly, about three per slice. This will help the worms curl and get squiggly when you microwave them for a short time. Serve on buns with blood-red ketchup. For a variation called “worms in dirt,” drain a can of black beans and chop them up. Place the beans in a bowl and heat briefly in a microwave. Top with the hot dog strips to look like worms in dirt. Oh wait, I was wrong: Worms in dirt isn’t the simplest Halloween recipe; this one is. You don’t even need a heat source to make a healthy snack of edible eyeballs. Peel a couple (or as many as you need) carrots and cut them cross-wise into 1-inch-thick cylindrical chunks. Stand each of the chunks upright on end and top each carrot piece first with a dollop of cream cheese, followed by half a pitted black olive. The result is carrot snacks that look a lot like eyeballs. Now, let’s all go get scared: Happy Halloween!